Enjoy this recipe from Harvest Kitchen Cookbook (M784). Spray a Bundt pan with non-stick vegetable spray. Place both tubes of dough into pan, seam-side up, joining ends together to form one large ring. Pinch edges to seal tightly. Lightly spray top of dough with non-stick vegetable spray. Bake at 350 degrees for 40 to 45 minutes, until golden. Carefully turn out; cool completely. Combine bacon, mayonnaise and onion; mix well. Slice bread horizontally. Spread half the bacon mixture over bottom half of bread. Top with turkey, ham and provolone. Place on an ungreased baking sheet. Bake at 350 degrees until cheese melts. Top with tomatoes and lettuce. Spread remaining bacon mixture on top half; place over lettuce. Slice into wedges. Serves 8. In a bowl, combine dry cake mix, butter and condensed milk. Press half of batter into a greased 13″ x9″ baking pan. Bake at 350 degrees for 10 minutes. Remove from oven; arrange candy bar slices Press remaining batter over candy bar layer. Return to oven; bake an additional 20 minutes. Cool; cut into squares. Makes 16 to 20. Patch, Gooseberry (2012-05-07). Circle of Friends Cookbook 25 Brownie & Bar Recipes (Kindle Locations 41-42). Perseus Books Group. Kindle Edition. 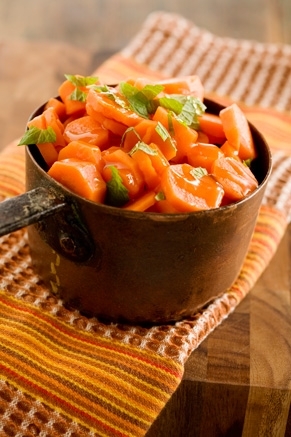 Place carrots in a steamer basket over boiling water. Cover saucepan and steam 7-8 min or until carrots are tender. Transfer carrots to a bowl. Toss with remaining ingredients. Salt and pepper to taste. 2.In large bowl, beat all cupcake ingredients with electric mixer on low speed 30 seconds. Beat on medium speed 2 minutes, scraping bowl occasionally. Divide batter evenly among muffin cups. 3.Bake 18 to 22 minutes or until toothpick inserted in center comes out clean. Cool 10 Minutes; remove cupcakes from pans to cooling rack. Cool completely. 4.In medium bowl, mix frosting and food color until blended. Frost cupcakes. Sprinkle sugar on small plate; roll edges of cupcakes in sugar. 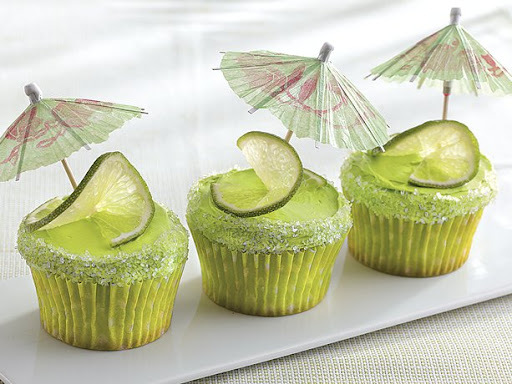 Cut small slit in lime slices; twist and place on cupcakes. Poke 1 umbrella into each cupcake. Store loosely covered in refrigerator. 1. Heat oven to 350°F (325°F for dark or nonstick pan). Spray bottom and sides of 13×9-inch pan with baking spray with flour. 2. In large bowl, beat cake mix, half-and-half, oil and eggs with electric mixer on low speed 30 seconds, then on medium speed 2 minutes, scraping bowl occasionally. Pour into pan. 3. Bake 30 to 35 minutes or until toothpick inserted in center comes out clean. Cool 20 minutes. Poke cake every inch with tines of meat fork or a table knife. Pour syrup slowly over cake, allowing syrup to fill holes in cake. Cool completely, about 35 minutes longer. 4. Spread whipped topping over cake. In medium bowl, gently mix strawberries, jam and sugar. Top each serving with strawberry mixture; garnish with lime peel twist. 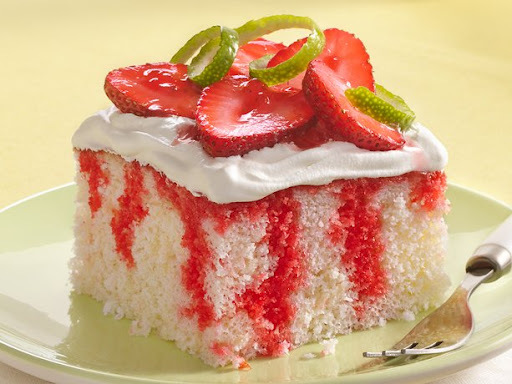 Store covered cake and strawberry mixture separately in refrigerator. Patch, Gooseberry (2012-05-07). Circle of Friends Cookbook 25 Brownie & Bar Recipes (Kindle Locations 21-24). Perseus Books Group. Kindle Edition. In a large bowl, beat together butter and sugar until fluffy; stir in vanilla and egg. In a small bowl, combine flour, baking soda, baking baking powder and nutmeg. Add flour mixture to butter mixture; mix thoroughly. Fold in apples and nuts. Spread batter in a greased 9″ x9″ baking pan. Bake at 350 degrees for 30 to 35 minutes. Cool and cut into squares. Makes one dozen. 1. Preheat oven to 350°. Bake pecans in a single layer in a shallow pan 6 to 8 minutes or until lightly toasted and fragrant. 2. Microwave chocolate and butter in a large microwave-safe bowl at HIGH 1 to 1 1/2 minutes or until melted and smooth, stirring at 30-second intervals. Whisk in sugar and eggs until well blended. Stir in flour. Spread batter into a greased 13- x 9-inch pan. 3. Bake at 350° for 25 to 30 minutes or until a wooden pick inserted in center comes out with a few moist crumbs. 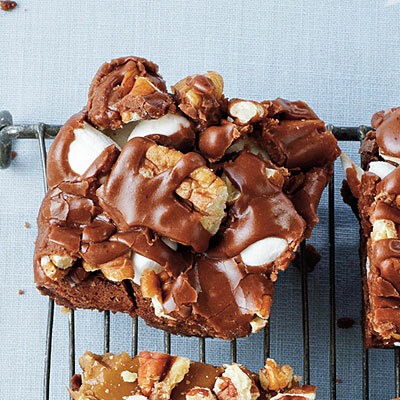 Sprinkle warm brownies with toasted pecans and marshmallows. 4. Prepare Chocolate Frosting. Pour over pecans and marshmallows; spread to edges. Let cool 1 hour on a wire rack. Cut into squares.